Quick and easy berry tart using a quest bar for the base then filing it in with homemade low sugar raspberry chia jam. Make the raspberry chia jam - heat a small pan over a medium heat then pour in the raspberries. Stir for a few seconds. Add the lemon juice and maple syrup. Stir raspberries and start mashing them with the back of a wooden spoon as they cook. Continue doing this until all the raspberries have been mashed and you're left with a smooth sauce. Turn the heat off then add in the chia seeds. Leave the mixture to cool slightly then transfer to a bowl/jar and store in the fridge for a couple of hours to set into a jam. Microwave your quest bar for 10-15 seconds just to soften it up slightly. Press the softened quest bar into a small tart tin. Bake for 4-5 minutes or until the edges have browned. 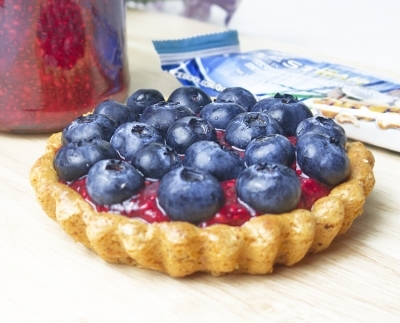 Fill the tart with a few teaspoons of the raspberry chia jam and decorate with blueberries or any other berries/fruit you prefer.